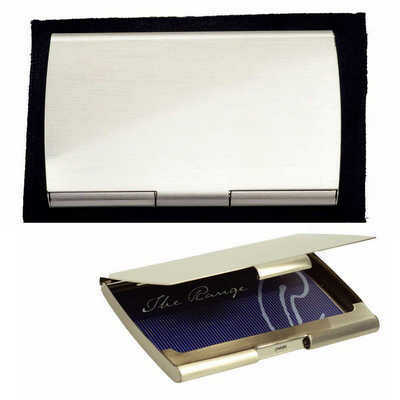 Description: Metal/silver nickel executive style pocket business card holder. Features: Holds approximately 17 business cards. Engraves silver (tone on tone) Packaging: Wrapped in tissue paper ?in a black velvet pouch ?in a polybag ?sitting in a black moulded insert and presented in a plain black 2 part gift box. ?Packaging Size: 121mm(h) x 110mm(w) x 40mm(d) Colour: Silver. Material: Metal/silver nickel. Product Size: 100mm(w) x 60mm(h) Freight details : 60 per carton, 9.8kgs, 47 x 40 x 23cms; Decoration Type(s): Colour Print / Full Colour Print / Laser Engrave / Print with Dome Decoration Area: Laser: 30mm(w) x 20mm(h). ?Pad: 50mm(w) x 30mm(h). Price includes : 1 Colour 1 Position Print. Setup is included.